From his earliest years, award winner Richard Myer had an insatiable desire to create 3-dimensional objects. After earning a B.F.A. degree from Brigham Young University he returned to his native New York City and studied at the Art Students League and the Sculpture Center. He worked as an art director until moving to California in 1970 where he began his professional career. He has done bronzes for the Tokyo Stock Exchange and the Disney Company. John Wayne’s bronze grave marker was sculpted by Richard and he was commissioned to sculpt 3 large bronze figures for a memorial park in Arlington Heights, Ill. 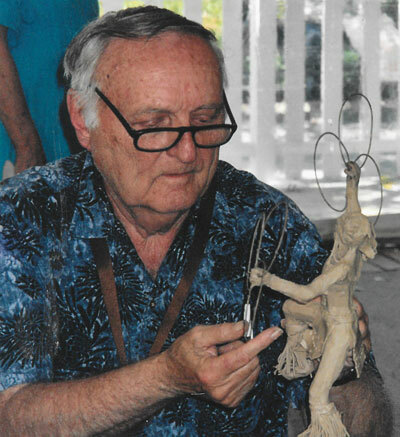 He went on to sculpt an 8-ft figure of Frank Miller, founder of Mission Inn at Riverside, CA. In 2005 he completed a large outdoor monument for the L.A. Sheriff’s Dept in San Dimas, California of 4 bronze figures which were placed in their new sheriff’s station. In 2007 he designed and created an 11ft high statue of Andres Duarte which was placed in an outdoor park in Duarte, CA. A well seasoned and dedicated sculptor, he believes that knowledge, observance and practice are the basis of creativity. Copyright © Richard Myer | Bronze Sculptor 2019 All Rights Reserved.